Hardly does any lame man in the tech world know Amazon for any specialty other than its e-commerce specialty. Another specialty of Amazon is the engineering of smart devices. A typical example is the Fire HD 10 tablet, a beautiful piece engineered by Amazon. 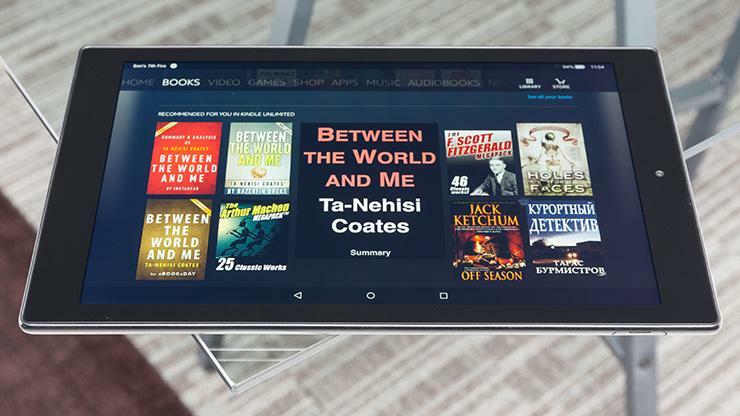 Providing a thin aesthetic, the tablet offers a classic HD display. Let’s take a closer look at the Fire HD 10 from Amazon. Don’t go anywhere. Amazon Fire HD 10 is one of the thinnest tablets Amazon has ever produced. According to Amazon, Fire HD 10 was described as the “largest display on our thinnest tablet yet”. Its weight of 432g provides it with its light nature. The tablet’s power button, microphone, micro USB port, 3.5mm audio jack and volume buttons are located on the top of the device if viewed in a portrait manner. The Amazon logo is placed at the uppermost region of the tablet’s rear while a camera is placed at the top left-hand side of its rear. The dimension of the tablet is 262 x 159 x 7.7mm. The tablet comes in three colour variants which are: Silver Aluminium, Black and White. Fire HD 10 has a large display of 10.1 inches with Full HD display. Its display type is the IPS capacitive touchscreen. The screen resolution is marked at 1280 x 800 pixels. The pixel density of the touchscreen is 149 pixel per inch (ppi). The tablet has three variants with regards to this category. The three variants are 16GB, 32GB and 64GB. This handles the storage of files such as music, videos, documents and photos. For the Oliver Twists, the tablet supports the use of a micro SD card. The storage can be extended to 200GB with the aid of the micro SD card. The 1GB RAM apportioned to the tablet is a far cry from average. The RAM handles the running of the apps and multi-tasking. A 2GB RAM would have been more encouraging. Amazon Fire HD 10 tablet uses MediaTek quad-core processor. Two of the processors are clocked at 1.5GHz while the remaining two are clocked at 1.2GHz. The tablet uses the latest Fire OS – Fire OS 5. The Fire OS 5 is an OS that is based on the Android 5.0 Lollipop. The rear camera of this device has a 5MP shooter for the capture of images. Its rear camera is void of a LED flash. For taking selfies, the frontal has a 720p HD camera which also lacks the presence of a LED flash. The Fire HD 10 tablet uses a non-removable Li-Ion battery. The battery capacity of the tablet promises 8 hours heavy usage. Well, this battery duration is very low for the tablet’s powering. Light users will find it easy to use this battery lifespan. The battery has a slow charge time of 5hours. There’s no fast charge feature enabled in the tablet. The price of Amazon Fire HD 10 is $229. In Nigeria, the price of Amazon Fire HD 10 ranges from NGN80,000 to NGN85,000.